If you are constantly facing the problem of excessive overheating of your car and wondering the causes for its frequent occurrence, this article will surely help you out. One day while going to attend an important official meeting or a friendly picnic, your car engine suddenly starts jamming and stops with flames coming out of the engine. All concerned, you come out of the driver’s seat and open the engine bonnet to check what was wrong with your first love (read: car). While you are all so disturbed and worried about the car condition, people on the road start honking, swearing and shouting at you. Are you still wondering what went wrong? 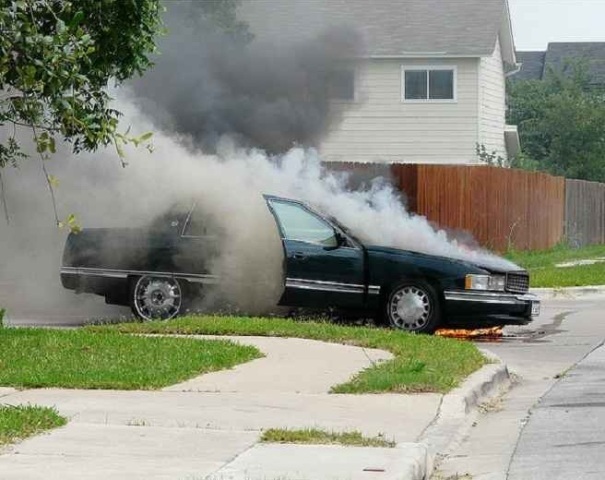 Push your car aside and relax your nerves, for it probably happened due to engine overheating. One of the most common car-related problems, overheating occurs because of the failure of car’s coolant system. Engine overheating can pose serious threat to car’s performance and engine, if left unchecked. Whatever you may think your car to be, at the end of the day, it is a machine with many mechanical parts that are required to execute simultaneously and efficiently to perform well. Problem to any part would ultimately affect the operation of the car. Car overheating is caused due to a number of factors. Knowledge of these various factors is important to prevent the overheating of the car. Apart from this, timely and frequent maintenance would help prevent sudden serious car problems. Here listed are some of the factors related to the overheating problem of your car. It is among the most common causes for the overheating of your car engine. Thermostat is a small valve that on predetermined temperatures allows the coolant stored in the car radiator to flow in and hence, cools the car engine. If it freezes or gets stuck in a closed position, it would stop the flow of coolant, ultimately causing overheating of the car. The best way to check if the thermostat is functioning well is to feel the upper radiator hose. If it gets warm with the warming of the engine, it means that the thermostat is working fine. However, if it doesn’t get warm, this would mean that there is some problem with thermostat. Radiator takes excessive heat from the coolant of engine and radiates it to the outside air. If there is faulty radiator or if it gets clogged with dust and debris, it would seriously affect the heat reducing capabilities. Hence, it would build the heat in the circulating coolant and ultimately in the car engine. If you find the radiator is clogged with dust, dirt or debris, take the car to the service centre and get it professionally cleaned for proper functioning. Water pump is a vital part of car’s interior cooling system. It pumps the coolant throughout the car’s engine, hence maintaining its heat level. A faulty water pump can cause overheating, if it fails to provide the adequate pressure to circulate the coolant through the engine. If your car engine starts overheating while turning on the AC of the car, it means there is a problem with the car’s water pump. With a faulty water pump, car engine wouldn’t run enough. As such, it is best to get it replaced as soon as possible. Antifreeze helps in keeping the engine temperature under control in winter, by preventing it from freezing. But in summers, it just does the opposite; it prevents the engine from getting overheated. As such, check on to see if the antifreeze is functioning properly or not. Check your car frequently for any leaks in coolant system. Coolant should be circulated throughout the car engine to check the excessive heating. Low level of coolant could affect the heat reducing ability of the coolant system hence, causing overheating. Engine oil maintains the operating heat of engine by preventing the excessive friction in the engine parts. But lower level of engine oil can lead to excessive friction and consequently, increase the operating heat. It ultimately leads to overheating of the engine. So, now that you know the reason for the overheating of your car engine, follow the prevention tips and avert yourself from getting struck at wrong places at the right time!